Well, in my Bible reading the last couple of days during “Coffee with the Lord” I’ve felt like that is what Jesus has been telling me… I’ve been reading passages from John 14-16. The good news: Jesus isn’t going to let us flounder in a difficult world filled with trials, temptations and even persecution… He sent the “Helper” – the Holy Spirit to help us, instruct us, lead us and empower us! The bad news: He was going to leave earth after His death and resurrection and return to heaven. There would be trials, difficulty, and persecution… even death for His followers. 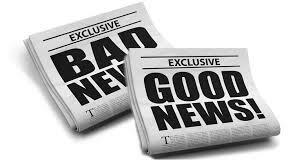 Some bad news… Yes. But Oh, the good news!!! The peace He gives regardless of what we have to face in the future! Peace beyond comprehension! (Check out Philippians 4:6-7) And the promise – the assurance? “Take heart! I have overcome the world!” Think I’m going to make it… and make it victoriously, regardless of what the future brings!